The countdown to Christmas has begun and with the holiday cheer in the air, Hair Club® wants to call attention to those less fortunate. Hair Club is continually committed to lifting spirits whether it’s by restoring looks and confidence through hair restoration or by giving back to those in need. Kids has offered free hair restoration services to children suffering from hair loss conditions. For several years, Hair Club has proudly supported the Toys for Tots Foundation, playing an active role in delivering a message of hope to underprivileged kids during the holidays. Approximately 13 million children in the U.S. live in poverty. Many of these children would not be receiving a gift from Santa if it weren’t for the U. S. Marine Corps Reserve Toys for Tots Program—an organization dedicated to giving Christmas gifts to less fortunate children and providing inspiration for them to become responsible, productive, patriotic citizens. This year, each Hair Club hair restoration center is participating as a Toy Drop Site for staff and clients to donate unwrapped gifts. 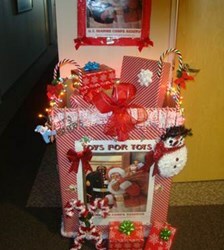 To encourage participation, Hair Club employees across the country are competing in a drop box decorating contest. All Hair Club location s have put a cheerful spin on their donation box, giving it a festive holiday makeover. Cardboard boxes have been transformed into scrumptious gingerbread houses, cozy fireplaces and fluffy snowmen, among other creative themes. The enthusiastic staff at the West Palm Beach Hair Club has taken their gift-giving spirit outside the box—treating clients who donate a toy with a piping hot plate of tater tots to say thank you during their appointment! Hair Club encourages all who can, to do their part in brightening a child’s Christmas by participating in their local Toys for Tots campaign. Toys can be donated at specified toy drop locations and volunteers are always welcome at local warehouses. Learn more here: http://www.toysfortots.org/donate/toys.aspx. Hair Club is excited to be giving back to the community and wishes all who celebrate a very happy holiday. Founded in 1976 by Sy Sperling, Hair Club is the leading provider of all proven hair restoration solutions FDA-approved or cleared to work for hair loss. Hair Club has granted more than 500,000 men, women, and children an experience that truly changed their lives. Today, Hair Club has 100 locations throughout the United States, Canada, and Puerto Rico and is a wholly-owned subsidiary of Tokyo-based Aderans Co. Ltd, the world’s leading provider of total hair loss solutions. Aderans brands in the U.S. include Bosley. Prev:PAI Medical Group has started using ARTAS robotic hair transplant technology.